The InterOceanic Highway (Carretera Interoceánica is the official Spanish name and Estrada do Pacífico is the Brasilian name) will have a total distance by road of 5440kms from the Atlantic to the Pacific. The road is one of the biggest construction projects ever undertaken in América Latina. The highest point is 4850m or 42m higher than Mont Blanc, Europe's highest mountain. Twenty two bridges are being built including a spectacular new bridge of 722m across the Madre de Dios River at Puerto Maldonado in Perú. The InterOceanic Highway got off the ground due to the support from three Presidents Lula da Silva (Brazil), Alan García (Perú) and Evo Morales (Bolivia). All were key supporters of the project through which they sought the further integration and development of the three countries: Brazil – the giant of América Latina with its huge area of the Amazon, Perú with its Pacific coast and also with more than half its land area in the Amazon and the land-locked Bolivia with massive energy resources in need of infrastructure to transport them to the sea ports. Over 4650km are complete and fully asphalt covered. Work is progressing on the final section 736kms from the Amazon basin and over the Andes mountains. The cost has been budgeted at 1.3 billion dollars. 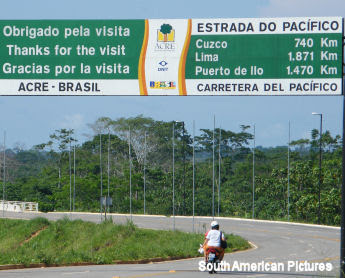 The InterOceanic Highway will open up the Pacific Ocean to Brazil and Bolivia. It will connect América Latina's biggest mega-city São Paulo with Perú's three ports on the Pacific Coast; San Juan, Mataraní and Ilo. América Latina has benefited from the boom in the world price for mineral resources. Perú is the world’s largest silver producer, second largest producer in copper and zinc and sixth in gold. Peru has advanced considerably over the last five years. Since 2006 growth has accelerated, averaging 7% despite the world recession. The share of Peruvians living in poverty has fallen from 49% in 2004 to 35% in 2009. Social indicators have improved immensely - between 2005 and 2010 Perú climbed 24 places in the United Nations Human Development Report. Much of the Pacific coast, where farmers export asparagus, grapes and other products enjoys almost full employment in 2011. Though many parts of the Andean highlands remain poor, the arrival of the InterOceanic Highway has cut journey times meaning that many farmers there too have joined the export boom. Much of this succes is due to the vision of outgoing Peruvian President Alan García and his predecessor Alejandro Toledo. Both pursued policies of price stability, fiscal rigour, foreign investment, open trade and investment in major civil works infrastructure. Unfortunately Alan García was not able to choose a sucessor in the same way that Brazil’s Luiz Inácio Lula da Silva and Colombia’s Álvaro Uribe had managed to do in 2010. His party, did not even have a candiate in the first round of presidential elections held in April 2011. None of the three centrist moderate candidates made it to the second round of voting on 5 June 2011. Instead the Peruvian electorate was presented with Ollanta Humala, an ex-army officer with affiliatons with Hugo Chavéz and Keiko Fujimori, the daughter of the former president now serving a 25 year prison term for human rights abuses. Ollanta Humala, prevailed by a narrow 3% margen with a manifesto programme that looks unlikely to deliver the growth rates needed to continue to lift peruvians out of poverty and at best reads like a recipe of missed opportunities for the next five years. When did the road officially open? Is it open now - for sure? And, how safe is it. Wow! this site is very helpful for us.Add more straight silk base closure An excellent solution which can be found for anyone who is suffering from the damaged scalp and hair issues is the silk base lace closure.